I love Caribbean cuisine and whenever we get a chance, we visit "Yeahman" our favourite family run Caribbean joint in Bournemouth to have some delicious Jerk Chicken or Goat curry served along with a satisfying kidney bean rice and salsa. 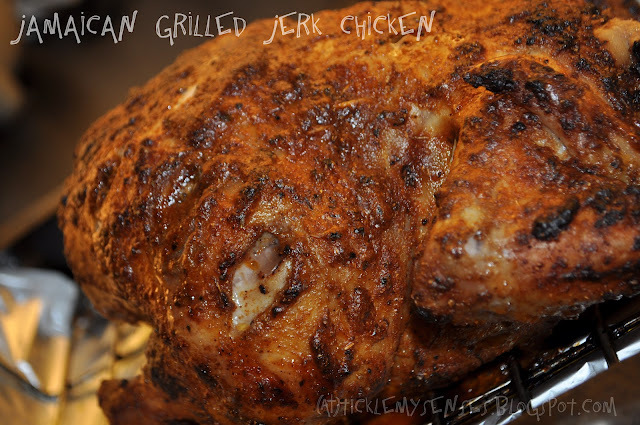 I have tried many versions of the jerk chicken and this grilled version I find simple and irresistible. It is herby, spicy, tangy and delicious. A favourite for barbeques. You could use the jerk seasoning available in most large supermarkets or you could use this simple recipe to make your own jerk seasoning. I add a few more ingredients to spice up the jerk seasoning and let the chicken soak in this lovely marinade for a few hours before baking/ barbecuing. 1. Make deep slits all along the chicken. Pat the skin dry. 2. Put all the ingredients for the marinade in a bowl. Mix well and make a paste using oil. Check for salt and sourness and adjust accordingly. 3. Apply marinade all over the chicken, make sure the marinade seeps through the slits well. Apply the marinade inside the cavity as well. Keep aside for atleast 3-4 hours covered in the fridge or overnight. Remove chicken from fridge atleast an hour before cooking to allow it to come to room temperature. 4. Place the marinaded chicken on a rack in a roasting tin, and place the tin in the centre of a preheated oven at 180C or 350F and cook for an hour, turning once after 30 mins and baste with the juices from the bottom of the baking tin. (If in the last 15 minutes the chicken is browning too much cover lightly with a piece of foil and allow it to complete cooking covered). Check whether the chicken is done by using a knife, make a gash along the thigh or leg of chicken, the juices should run clear. 5. Rest the cooked chicken for atleast ten minutes before serving. Cut the chicken into 8-10 large pieces, squeeze over lemon juice and 1/2 tsp of jerk seasoning(optional) and serve along with red bean rice and salsa or simply with a fresh salad and potato wedges. Leftover chicken can be used to make chicken sandwiches. Simply shred the left over chicken, add a couple of chopped black olives, a tsp of shredded cheddar cheese, a few lettuce leaves, add a little mayonaisse to moisten the mixture, a tsp of chilli sauce if you like it hot or sprinkle a little pepper powder, check for seasoning, place between 2 slices of bread and voila you've got yourself a wholesome tasty sandwich. Ahh..this is really mouthwatering!! You've perfectly baked too! Truly yummy preparation.So tempting and worth it! It looks absolutely scrumptious ! I love the crispy and evenly browned skin ;) Yummmmm !!! Thanks friends for the lovely comments.....hope you enjoy!! love this crusty chicken. Thyme smells good. nice preparation.So yummy and tasty..loved it! 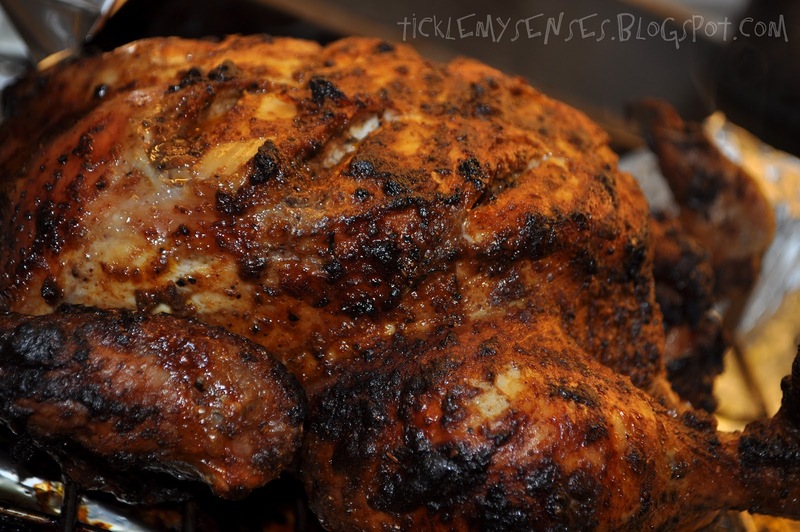 I love Jamaican Jerk Chicken and this is a nice recipe. Thank You. wow.. simply awesome.. u have good collection of recipes..